Biography of French Late Gothic Sculptor. The medieval artist Michel Colombe is considered one of the last important International Gothic sculptors of France. His name was buried in history until 1727 when he was 're-discovered' as the sculptor of the magnificent tomb of Francis II, the last Duke of Brittany (Nantes Cathedral, 1502-7). Today, his reputation rests even more on his marble relief, 'St. George and the Dragon' (150809, Louvre), a work of late Gothic sculpture that blends Loire Style Gothic fantasy with Italian Renaissance modelling. Very little is known of Colombe's life and only two works of sculpture may definitely be attributed to him. He may have been born in Bourges, central France around 1430. In 1502 the last Duchess of Brittany, Anne commissioned him, to create a marble tomb to commemorate her parents, Francis II of Brittany and his wife Marguerite de Foix. The design of the tomb came from the sculptor Jean Perreal, and it was thought for many years that he also executed the work. Some confusion was bought about when the tomb was disassembled and buried for safe keeping during the French Revolution. We now know in fact, that Colombe carved the marble monument and it's religious figures and animals. The tomb is viewed as one of the finest sculptures in northern Europe. It displays a beautiful harmony and great refinement of execution and modelling. It demonstrates a mastery of technique and displays an influence of late Gothic art, of the genre produced in the Loire valley. The only other work attributable to Colombe is a marble relief sculpture, St. George and the Dragon (150809), now on show at the Louvre Museum, Paris. It is the quality of the workmanship and the combination of French Gothic and Italian Renaissance sculpture that gives this bas-relief it's critical acclaim. Originally the piece had been commissioned for an altarpiece for the Chateau de Chaillon. 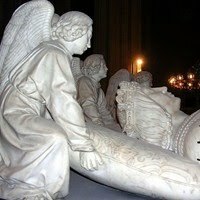 Colombe may also have created the two gisant figures of Charles VIII's deceased children on their monument (1506) in Tours Cathedral. Also, an Entombment at the Solesmes Abbey (1494-98) may be his work. To learn how to judge artists like the Late Gothic French sculptor Michel Colombe, see: How to Appreciate Sculpture. For later works, please see: How to Appreciate Modern Sculpture. Colombe's workshop was reported as being very smoothly run with the help of three important assistants. The sculptor Guillaume Regnault worked with Colombe for over 40 years and undertook most of the actual carving in the workshop. Colombe wrote that he is: 'able and experienced enough to execute in large scale the carving of the figures used in said tomb, following my models; for he has served and aided me in such matters for forty years or so'. The mason Bastyen Francois undertook the architectural elements of large-scale monumental projects. Then there was his nephew, Francois Colombe, an illuminator whos job was draft a job, then paint the small scale model which would be produced by Guillaume and Basteyn, so as to emulate the rich materials to be used in the full scale versions  black and white marble, gilt-bronze inscriptions, coats of arms and so on. It was quite common at the time for families to work in the same workshop, Guilds recommended this, as family members typically received less pay.